To be a leader you need people who follow you! A leader’s title does not bestow automatic followership. A real leader will engender willing followership as they choose to trust you, accept your directions and contribute to yours’ and the team’s success. And in the same way that not all leaders are the same, so it is that followers will be different. Your followers will have different personalities and styles, but a big factor in how they behave will be based on how you lead them. Your leadership approach will, over time, shape the type of followers you get, as they respond to your style, feedback, incentives and conversations, and as you recruit people into your team. Successful leaders build a culture to promote and support a positive followership, one where everyone feels empowered and engaged, is aligned to the organisation’s purpose, feels safe in raising concerns and steps up to take ownership within their roles. 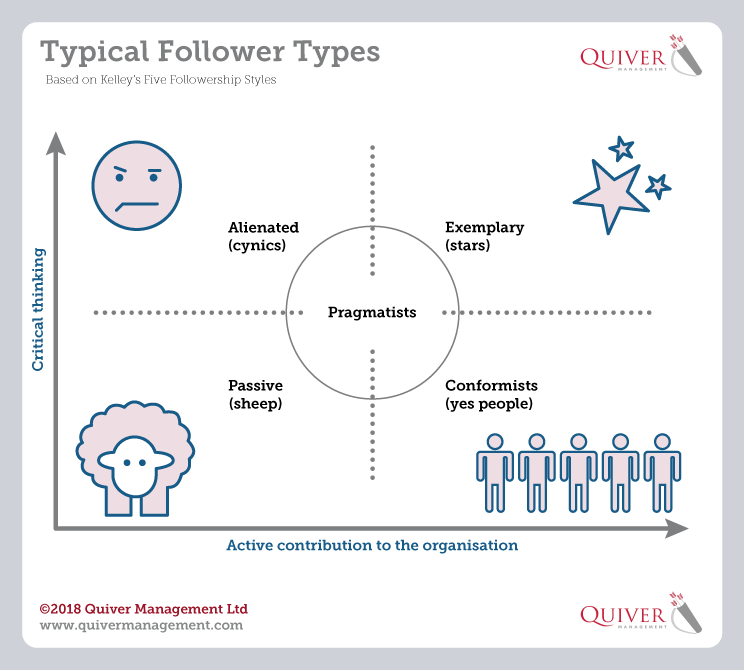 According to Kelley’s Five Followership Styles (1992), followers are evaluated on their levels of critical thinking compared to their preference for more passive or active engagement. What is the current leadership-followership situation in my organisation? What is the predominant followership behaviour here? What is the potential for improvement? How well do we reward exemplary followers? How well do we listen to their independent and critical thinking and thank them for their work? How do we deal with alienated and cynical followers? They display independent thinking, but can we encourage and enable them to contribute more positively to the success of the business? Their current cynicism may be toxic for morale – how well do we address this? Conformist may take orders well, be engaged and get the work done. But is that good enough? Should and can we develop them to be more independent thinkers? How much supervision does the “sheep” require from their leaders? The passive followers place a high demand on their leader to tell them what to do and their contribution is likely to be minimal. Many organisations will have a significant group of pragmatist followers. These followers survive well but how can we tap into their potential to think independently and contribute more? To what extent do I and our leaders in our organisation encourage or block critical thinking? What evidence do we have? How well do we enable, motivate and engage our team to contribute actively to the business? In what areas and how do we develop our leadership skills to get star followers? How does our organisational structures, processes, policies etc. help or hinder good followership? 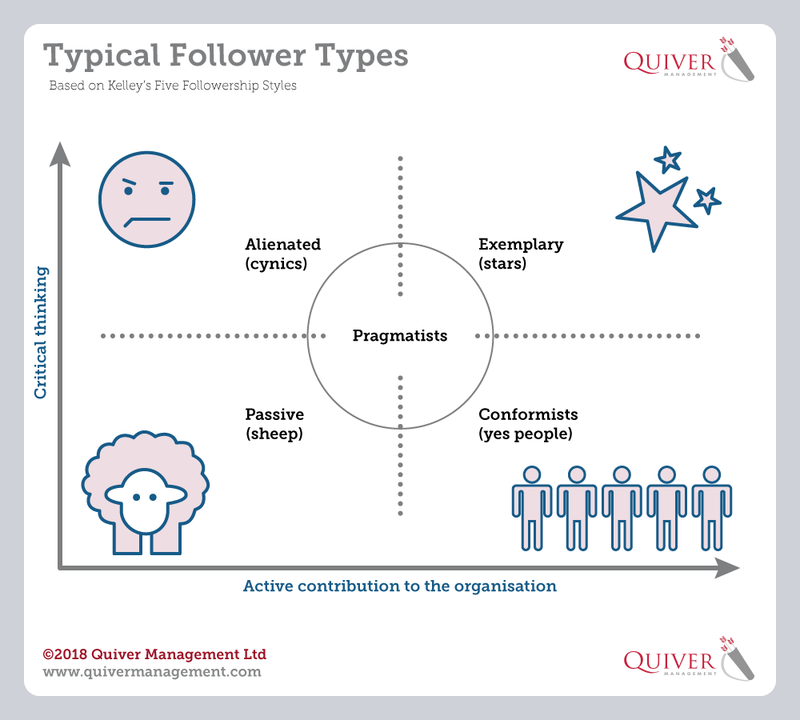 Exemplary followers possess the traits required for a thriving leader-followership model. They are highly engaged, are able to think independently and provide constructive criticism. They co-operate and contribute positively towards achieving the organisations’ aims, forming stronger teams whilst achieving and stretching their own individual potential. As a leader what can you do? Through good coaching and development, effective communication, sharing the organisation’s vision and providing positive support, you’ll create an environment where they can thrive, feel valued, contribute and provide critical thinking for the good of the organisation. They’ll feel empowered to be their best, which will promote loyalty and attachment to their teams, leaders and the organisation as a whole. Effective leaders know when to listen, and when to accept that others’ ideas are equally or perhaps more valid than their own. This is not a weakness but a sign of strength, for which you will gain respect and augment your leader-follower relationship. With so much riding on the effectiveness of your leaders to engender a positive, exemplary following, our leadership training and ILM qualifications are well placed to elevate skills and create a leadership approach where the quality of followers is not left to chance. Learners have the opportunity to practice and hone their skills, using work related assignments to learn how to lead, motivate and inspire. We customise the qualification to meet the development needs of your organisation, so new skills are relevant, actionable and create an impact straight away. You can find out more about our ILM qualification here. Heat moments - what are they and why are they good for business?